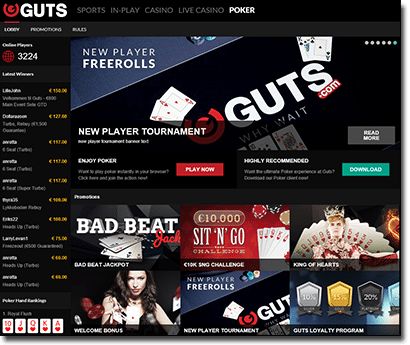 Guts Casino has launched its brand new poker platform, and it looks to seriously rival other top online poker operators, such as 888 Poker and PokerStars. Register a poker alias with Guts.com and you will automatically receive a $1000 welcome bonus, which is released in $5 batches. Additionally, for every $25 you contribute towards the rake, you will earn a $5 bonus. The released bonus money is paid in cold, hard cash – no wagering requirements. You will also automatically start earning Guts Poker Loyalty Points when you play real money cash games and tournaments. This Loyalty Program rewards players the more they play – work your way up the loyalty ladder from the Silver tier (1 to 499 points) to the Gold tier (500 to 999 points), then the Platinum tier (1000 to 2999 points) and finally the Diamond tier (3000 points plus). The higher your loyalty membership level, the more points you will be able to convert to cold, hard cash (track your status and points amount in the poker lobby. Earn $1 for every 30 points you accumulate. Once you hit the right amount of points for the next tier, you are upgraded instantly. Players can opt to play instantly via their Web browsers (known as instant play) or download the poker client for the ultimate gaming experience. The interface itself showcases a neat and slick designed, with all sectors of the poker client easily accessible and easy to manage. Browse through the list of cash games and tournaments, tailor the games to your desires, check out the rules to all the diverse poker titles and conduct all your banking securely through the Guts banking tab (ample deposit and withdrawals options, and all globally trusted). Emails will be responded to as soon as possible (within 24 hours). Sign up with Guts Poker Casino today and enjoy a host of free promos and bonus, and entry in to some fantastic tournaments and competitions. Play with your mates, and chat with other poker enthusiasts from across the globe.